Members of various classes from West End High School were at the unveiling of the new WEHS highway marker on Highway 49 this Saturday. The site was chosen because nearby is the site of the second West End High School building, now known as Bluestone Middle School. Representatives from the three branches of the West End High School Alumni Association — Richmond branch, Metropolitan branch and Mecklenburg County branch — helped to celebrate the unveiling of the Highway 49 marker commemorating the school this Saturday near Skipwith. The marker was erected by the WEHS Alumni Association to honor and celebrate their school, one of Mecklenburg County’s high schools established to educate local African-American. The school first opened in 1935 with the assistance of Jeanes Fund, which supported educational efforts in rural African-American communities. Before unveiling the plaque, John Royster, president of the West End High School National Alumni Association, noted a few of the dignitaries present, among them Virginia Bowers Fenty of Clarksville, who as a member of the class of 1944 was probably the oldest alumnae attending the dedication, and Mavis Farrar, who taught science and math at the school from 1956-1961. 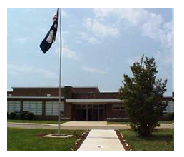 The plaque stands near the intersection of Highway 49 and Middle School Road (SR 698), in close proximity to the second West End High School building, now known as Bluestone Middle School. The first high school was taken by the US Army Corps of Engineers for its Buggs Island Lake/John H. Kerr Dam and Reservoir project. The second school facility opened in 1953. The plaque reads, “Just to the east is the former West End High School, which served African Americans during the segregation era. With the help of Matilda M. Booker, Mecklenburg County’s Jeanes Fund supervisor of education for blacks, local parents established the school in Clarksville in 1935. In 1951, the U.S. government purchased the West End property for the development of Buggs Island Lake. Using state funds set aside for a major school construction initiative under Gov. John S. Battle, the county built a new W.E.H.S., which opened here in 1953. The last class graduated in 1969, when the building became a junior high school. Also attending Saturday’s dedication were Glanzy Spain and his wife, Jean. Spain is the District 2 member on the Board of Supervisors and President of the Mecklenburg County Chapter of the West End High School Alumni Association. Also in attendance were Board of Supervisors District 8 member David Brankley, Mecklenburg County Sheriff Bobby Hawkins, and Dr. Jennifer Loux, highway marker historian and coordinator with the Virginia Department of Historic Resources. The West End marker was sponsored by the school’s national alumni association, said Royster. The Virginia highway marker program began in 1927 with erection of the first historical markers along U.S. Rte. 1. It is considered the oldest such program in the nation. Currently there are more than 2,500 official state markers, most of which are maintained by Virginia Department of Transportation, except in those localities outside of VDOT’s authority. The manufacturing cost of each new highway marker is covered by its sponsor.